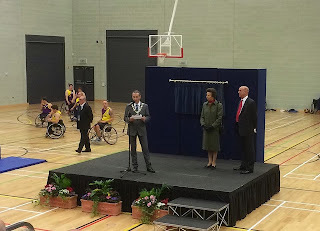 Official opening of Bangor Aurora Aquatic Leisure Complex last Tuesday 12 November 2013 by HRH The Princess Royal was a proud, positive moment for North Down with world class sporting facilities and the legendary 50 metre pool now available for everyone across the Borough and beyond. As Mayor of North Down I have greatly enjoyed watching Bangor Aurora Aquatic and Leisure Complex evolve from inception to construction and completion. By Working as One we have managed to deliver a world class facility for everyone. Whether it be through involvement of contractors, Council, government, Sport NI, Swim Ulster and local sporting organisations it fills me with great pride to be at the formal opening of the complex which will serve as a sporting hub for future generations across North Down and beyond.